E'GRID Uni-Axial Geogrids are meshes with elongated apertures made from high density polyethylene (HDPE) and generally used as reinforcement of walls and slopes. Their principle characteristic is good creep performance with low strain and high strength under constant load. E’GRID reinforced soil walls and abutments are composed of wall facing, and fill reinforced with E’GRID Products. They can be constructed quickly with simple technology, machinery and techniques and at low cost.They are tough and elastic composite structures of purpose designed multiple layers of E’GRID Reinforcement and fill. They can accommodate base deformation and have particularly good resistance to vibration and earthquakes E’GRID reinforcement can improve the bearing capacity and factor of safety of a structure and reduce construction cost. structures such as brick , stone or concrete, that would be needed with conventional techniques. 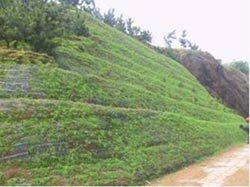 E’GRID Reinforcement can be used to construct steep slopes with a surface of natural vegetation. Construction involves raising the slope with E’GRID Products layered into the fill and wrapped around the face to the required slope angle. Using this technique safe structures with permanent vegetation faces can be built to integrate spent quarries into the local environment. The material of the failed slope can be excavated and reused with E’GRID reinforcement to reinstate the failed area. This process is low cost and has minimal impact on the local environment during and after reconstruction work.